What is a hospice volunteer and what do they do? What is a Hospice Volunteer? What Do They Do? Hospice care volunteers give their time and talents to help a hospice organization and the patients and families served by the not-for-profit hospice. Volunteers perform many important duties. Whether providing companionship in a patient’s home, greeting guests at an inpatient center, assisting with a special event, or handling other meaningful tasks — volunteers play a vital role that enables the hospice to more fully meet the community’s needs. At Samaritan, more than 470 volunteers help us carry out our critical mission. In return, they receive satisfaction and fulfillment — among many other benefits. In fact, Samaritan volunteers frequently say they get more from the experience than they give. Samaritan volunteer Joan Klinger says her husband “was treated with respect and dignity” and she, too, “received emotional support from Samaritan’s staff. “This experience led me to become a hospice volunteer,” Joan explains. In other cases, community members simply want to give back. *Samaritan requires a one-year wait period after a significant loss before a person can begin volunteering. Call now to learn more about becoming a hospice volunteer: (800) 229-8183. 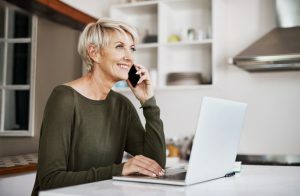 At Samaritan, hospice volunteers do many things and fill a variety of roles, including direct support to patients and families, administrative services, and participation on a wide range of committees. Patient/Family Support Volunteers visit patients and families in their home, long-term care facility, or one of Samaritan’s inpatient hospice center in Voorhees, N.J. 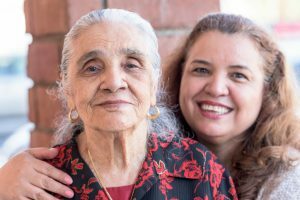 Volunteers provide companionship to both patient and family caregiver. They’re a caring, friendly face for chatting, reading, playing games, watching TV, listening to music, and sharing stories. 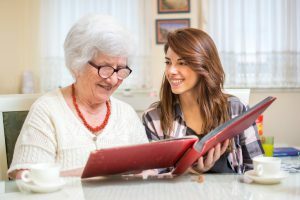 Volunteer visits also offer respite to the family caregiver, who can take a break from caregiving — and even leave the house to run errands or relax. At Samaritan, our 470-plus volunteers know that giving back to family, friends, and community matters. They tell us time and again that volunteering gives them a sense of fulfillment – that they feel blessed to take away more than they give! Vigil Volunteers provide a supportive presence during a patient’s final hours. They offer a beautiful final gift of peace and solace to those they serve. Vigil Volunteers may hold the person’s hand, speak or read to them, play the person’s favorite music, or simply be a comforting presence at the bedside. Vigil visits also help reassure family members, who may not be able to stay with the patient. Vigil volunteers must first serve as patient/family support volunteers and complete advanced training. Bereavement Volunteers make phone calls to those who’ve recently experienced a loss. They make calls at 2 months and 10 months with the bereaved, and remind them that Samaritan is still there for them if they need grief support or other assistance. Vet-to-Vet Volunteers provide support from military veterans to Samaritan’s veteran patients. Veterans often appreciate contact with another vet – someone who personally experienced the culture of military service – even if they served during a different time or place. Vet-to-Vet Volunteers may share stories and experiences; assist with pinning, medal and blanket presentations; record stories to preserve in the Library of Congress or for the family’s legacy, and help obtain missing medals. Samaritan’s specialized Veterans Hospice Program is a proud participant in the national “We Honor Veterans” program. Samaritan provides thorough training so volunteers feel comfortable and prepared for this rewarding service for their fellow vets. Samaritan thoroughly screens and trains its volunteers, ensuring safety and quality for patients, families, and the volunteers themselves. Greeters welcome visitors at The Samaritan Center at Voorhees, the organization’s freestanding inpatient center. These volunteers also answer phones and provide clerical support. Pet Therapy Volunteers provide direct support to Samaritan patients through visits with their already-certified therapy dogs. For more on pet therapy and other “complementary” therapies at Samaritan, click here. Music Performers share the gift of music with patients and their friends living in nursing homes and assisted living facilities. These hospice volunteers must be comfortable performing for groups, provide their own instruments (if applicable), and represent Samaritan at facilities. SamariTeens are volunteers ages 14 to 17 who support Samaritan’s patients and families through projects, and participation in annual events. Administrative Volunteers assist with office work in Samaritan’s headquarters in Marlton, N.J. Some administrative tasks could be typing, filing, collating, data entry phone calls and more.. Their behind-the-scenes contributions help Samaritan’s many vital services to operate efficiently. Thrift Store Volunteers help at Samaritan thrift shops in Pitman and Westmont, N.J. They assist with typical retail duties such as greeting customers, setting up merchandise displays, completing sales transactions, sorting donations, and maintaining store cleanliness and an inviting environment. Thrift Store Volunteers must have good-customer service and people skills; retail experience is a plus. African Global Partnership Committee helps Samaritan engage and educate the community about our sister hospice, Kawempe Home Care, in Uganda. The group helps plan events and sell Ugandan-made jewelry (Beads for Education) and more, with all proceeds going to Kawempe Home Care. No matter who you are, what you’re like, how old you are, how much education you have, or how much time you have to share, there’s a volunteer experience that will excite your interests and match your skills to meaningful service in our community. Corporate Giving Committee, a group of area business leaders helps Samaritan connect with and educate the corporate community. They share valuable information for businesses’ workforce and customers, and enlist their support. Gala Committee helps plan and execute Samaritan’s annual gala, which is presented by Holman Automotive. From theme and invitation, to honoree, auction, and raffle, this dynamic committee hosts one of South Jersey’s premiere events. Golf Committee helps plan and execute Samaritan’s golf outing each June, presented by the Richardson Family of Dealerships. In addition to a great round of golf, fellowship, and refreshment, the event features an online auction, a “dress loud” contest, and a visit from the Philly Phanatic. This committee has a great deal of fun planning and hosting the tournament, as well as securing auction items and sponsorships. Jewish Hospice Committee helps Samaritan engage and educate the Jewish community about hospice care, palliative care, and the importance of end-of-life planning. 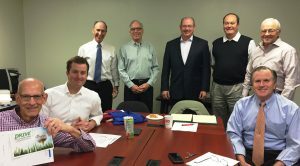 Planned Giving Committee is a team of leading financial experts who lend their time and knowledge to guide Samaritan’s charitable estate-planning efforts, and provide educational articles and seminars –raising awareness among their colleagues and the community. Via Lucis (Catholic Hospice) Committee helps Samaritan engage and educate the Catholic community. Each year the committee plans and hosts “Now and at the Hour of Our Death,” an educational workshop from the Catholic perspective. Other Committee Opportunities include helping with special community awareness initiatives, additional special events, and other fund-raising efforts. A person chooses to volunteer with a hospice organization for a variety of reasons. As mentioned, many people become hospice volunteers to express gratitude for help they’ve received during their loved one’s illness. The benefit of this type of community service is feeling like you’re making a difference where you live. You’re giving back to an organization that helped you through a difficult time, and you’re helping others. Helping others increases satisfaction and self-worth. Plus, it’s good for your health – mind, body, and spirit. Studies show doing regular volunteer work dramatically increases your life expectancy. As Allan Luks states in The Healing Power of Doing Good, volunteering improves your sense of well-being, decreases insomnia, builds a stronger immune system, and helps speed recovery from surgery. 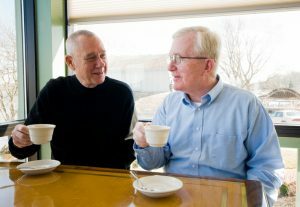 For others, an important advantage of becoming a hospice volunteer is that it enhances your college or job application. Giving back to the community reflects positively when a college or organization is evaluating your resume. 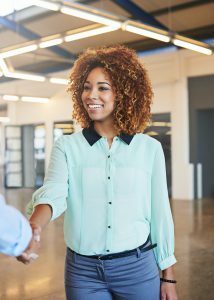 A study by Time Bank states 73% of employees would recruit a candidate with volunteer experience over one without. Moreover, 94% of employees who volunteered said the new skills they learned helped them get their job. Volunteering also can enhance your interpersonal skills, such as understanding people better, motivating others, and dealing with challenges. Finally, meeting new people is a benefit of becoming a hospice volunteer. 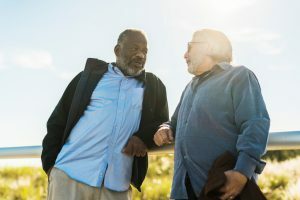 Helping at events, greeting guests at a Samaritan inpatient hospice center, or meeting other volunteers expands your social and professional connections to other like-minded people. Meeting new friends creates more fun in your life and helps improve your well-being. Do hospice volunteers need any special experience or training? Hospice volunteers don’t need any specific kind of experience. Samaritan provides the training needed to fulfill your volunteer responsibilities. Volunteering can be an opportunity to learn new skills, or to use the abilities you already have. 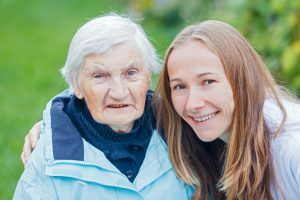 What personal qualities make someone a good hospice volunteer? Hospice volunteers should have good communication and listening skills, a nonjudgmental attitude, reliability, flexibility, and compassion. I’d like to help but I don’t have a lot of extra time. Can I still volunteer? Yes! Samaritan has many different types of volunteer opportunities, and some require as little as an hour or two a week. Just let us know how much time you’d like to give, and we’ll find the right volunteer position for you. I can only volunteer on certain days and at certain times. Can I still be of service? Yes! Samaritan will identify volunteer positions that match your schedule. Does Samaritan recognize its volunteers in any way? Yes! Samaritan expresses its gratitude for its volunteers in many ways, including an annual Volunteer Recognition Luncheon and an annual volunteer brunch. What are the steps to become a Samaritan volunteer? First, contact us about your interest in becoming a hospice volunteer. (Call Sally Cezo at 856-552-3235 or email scezo@SamaritanNJ.org.) We will explain the process at our orientations held monthly for any new prospective volunteer. If you’ve recently experienced a loss, we ask that you wait a year before volunteering. How can I become a hospice care volunteer for Samaritan? You do not have to be a healthcare professional to be a hospice care volunteer with Samaritan. We welcome you to use the talents you already have, or if you’d like, broaden your horizons and learn new skills. No experience is necessary, and Samaritan provides volunteer training. If you’re interested in volunteering or want to learn more, call Sally Cezo at (856) 552-3235 or email scezo@SamaritanNJ.org. You can also ask Sally about attending one of Samaritan’s monthly Volunteer Orientation sessions.